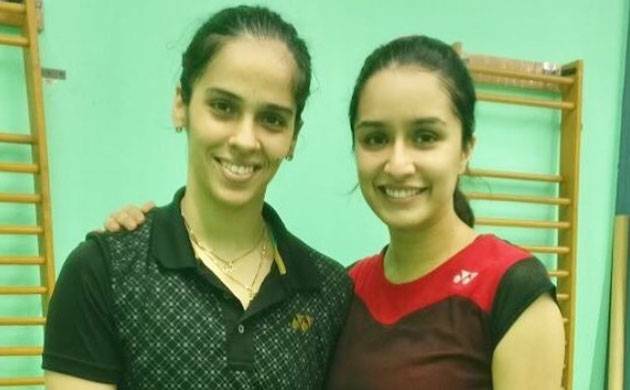 Shraddha Kapoor will be seen essaying the role of Saina Nehwal in the upcoming biopic of the badminton star and the diva has even begun training for the movie as well. Bollywood has been going through an era of biopics these days and movies on sportsperson are quite a normal thing now. While showbiz have several sports biopic Bhaag Milkha Bhaag, Mary Kom and Sachin: A Billion Dreams, the next movie to join the bandwagon is a biopic on Saina Nehwal. Interestingly, Shraddha Kapoor will be seen playing the badminton star in the biopic and the diva has even begun training for the movie as well. The Half Girlfriend actor is seen taking special tips from 2010 London Olympics bronze medallist to get tips on the sport, her life among other things. In fact, Nehwal and her Pullela Gopichand too were seen giving Shraddha giving a special training session. Saina even shared a picture of the training session on social media and wrote, "Today's badminton practice session ... Gopi sir , @ShraddhaKapoor and me #Biopic"
Saina will be directed by Amol Gupte, who has helmed movies such as "Stanley Ka Dabba" and "Hawa Hawaai". Interestingly, this will be Shraddha's second biopic. She will also be seen in Haseena Parkar biopic playing the lead role. Helmed by Apoorva Lakhia, Haseena: Queen of Mumbai is slated to release on September 22.